There are several puzzles called Ufo, but this one is made by Netblock. It consists of a disc which is split into two layers which can rotate about the central axis. Spaced evenly along the rim of the disc are 3 spheres of different colours. These are split into octants, so that when the layers of the disc are turned, one half of each sphere (4 pieces) travels with each layer. The spheres can also rotate in two halves about an axis along the disc edge. Although this puzzle is hard to describe, it is fairly easy to solve. An earlier version is called King Ring, or Sando Ring. This is much larger, uses bright colours, and has four spheres. It looks very much like a toddler's toy. The Ufo was patented on 13 May 1997 by Wai K. Chan, US 5,628,512. The King Ring was patented on 21 March 1996 by Zoltan Pataki, Istvan Varadi, and Attila Kovacs, WO 96/08297. The pieces in the left halves and the right halves of the balls never intermingle. The orientation of the puzzle itself is unimportant. The first restriction means that there are at most 12!2 / 4!6 = 1,200,622,500 possible positions. The second restriction means that the real number of positions is about 1/6th of that number because the puzzle can be held in 6 different ways (due to the three-fold symmetry around the centre, and because it can be turned over). As some positions are themselves symmetric, the exact number can best be calculated with Burnside's Lemma, and this gives 200,121,075 positions. If you also consider the three colours to be equivalent, then the number is reduced by a further factor of about 6 because the colours can be permuted in 3!=6 ways and those positions are all now considered to be the same. Burnside's Lemma shows that the exact number of positions is then 33,362,904. This is small enough for God's Algorithm to be calculated by computer, resulting in the following table. It shows that at most 15 moves are needed, or 16 moves if half turns count as 2 moves. King Ring / Sando Ring: There are 32 pieces, 8 of each colour. Using the same reasoning as above, we get 16!2 / 4!8 = 3,976,941,969,000,000 positions. The real number of positions is about 1/8 of this, and the exact number given by the Burnside Lemma is 497,117,746,919,592. Uwe Mèffert retails this puzzle, which is manufactured by Netblock. 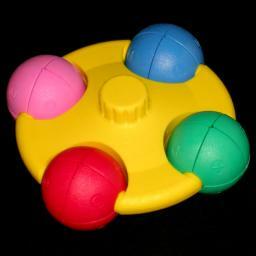 Hold the puzzle so that one ball is at the front, nearest you, with the other balls further away on the left and right. The four nearest pieces of the front ball will be individually called the top-left, top-right, bottom-left and bottom-right piece. The other 4 pieces of the front ball won't be named separately. The outside pieces of the other balls will also be described in the same way, for example the "top-right piece of the left ball" etc. Phase 1: Solve the front ball. In this phase the front ball will be solved. I will assume you will make it red, though you could of course solve a different colour first. Find any red piece in one of the other balls. Turn it so that it lies in the bottom front of its ball. Rotate the bottom disc layer to bring the piece to the front ball, at either the bottom left of the bottom right. Turn the piece up so that lies at the top left of top right. Turn the bottom disc layer back to its original position. This is not necessary when you are solving the first ball, only when solving later balls. Repeat steps a-e three more times, so that the top half of the front ball is completely red. You may have to be a little selective in your choice of pieces, since you want to do the steps twice for the left half and twice for the right half of the ball. 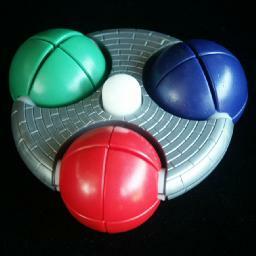 Turn over the puzzle, so that the solved red pieces are at the bottom of the front ball. Repeat steps a-e, so that the top half of the front ball also becomes red. Phase 2: Solve the remaining balls. Hold one of the unsolved balls in front. Choose one of the remaining colours, and apply phase 1 with that colour. Repeat a-b until all the balls are solved.